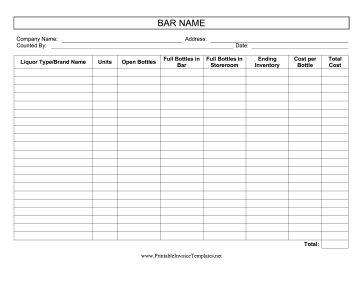 Bars and pubs can use this inventory list to track the number of liquor bottles in stock. It is available in PDF, DOC, or XLS (spreadsheet) format. This invoice is available in three versions: a free, ready-to-use version and two different $7.00 editable versions. The free version is available in Acrobat (.PDF) format: just download, open it in Acrobat (or another program that can display the PDF file format,) and print. The $7.00 editable DOC version can be opened with Microsoft Word, Google Documents, or any other word processor that can open standard .DOC files. You can customize it with your company name, customer information, and invoice items. The $7.00 editable XLS version can be opened with Microsoft Excel, Google Documents, or other compatible spreadsheet application that can read .XLS files. Like the DOC version, you can customize it with your company name, customer information, and invoice items. This XLS version also performs calculations for you, computing totals for your invoice. You can pay using your PayPal account or credit card. You'll be able to download the customizable invoice template within moments. If you don't see an invoice design or category that you want, please take a moment to let us know what you are looking for.